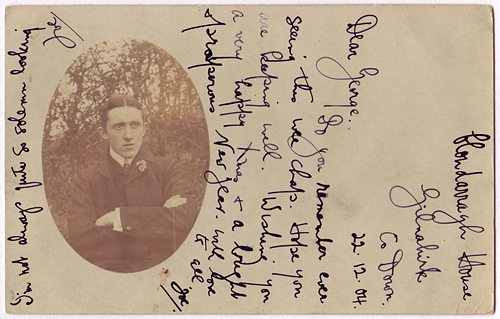 This photographic postcard displays a playful interaction between image and text. 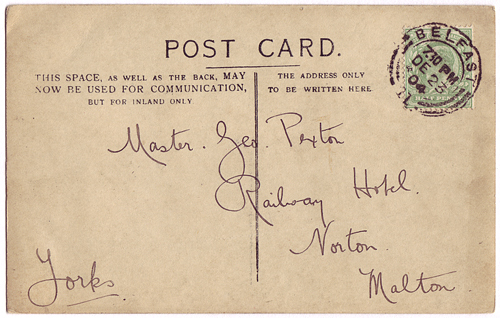 It was sent from Gilnahirk, County Down, to a young boy in Malton, Yorkshire, England in late 1904. The oval portrait, with bare trees silhouetted in the background, shows a man with his arms folded. He is wearing a stiff white collar and his well oiled hair is parted in the centre, a style that was very typical of the era. The boy in question was Master George Pexton who lived at the Railway Hotel, Norton, Malton, Yorkshire, a photograph of the establishment can be seen here. The postal mark places the sender in Belfast city on the evening of the 23rd of December and one can imagine the card being received just in time for Christmas. Overall, the document is a delightful snippet of early 20th century life.